I think this show is getting better and better as the episodes go along! There are a ton of things I really liked in this episode. To start off, the fight scenes were very well done and looked freaking awesome! 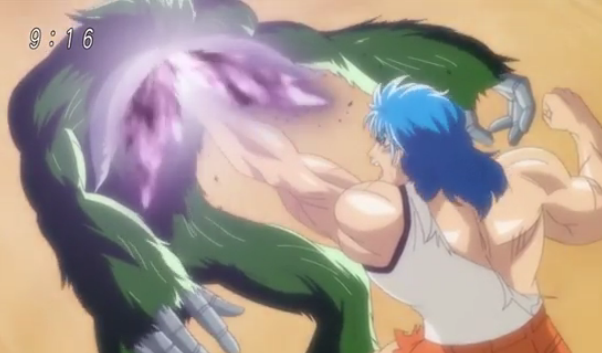 I loved seeing Toriko’s fight and it completely destroyed my fear from the first few episodes that they were going to be really weird and retarded (especially with his knife and fork technique -_-‘). Moreover, the characters are really sweet. I noticed it a bit last episode, however this episode really emphasized the fact that all the main characters are incredibly strong and awesome. I love Rin, Toriko, Mansam, Coco, heck, even Tina and Komatsu, and most of all Sunny (or Sani, not sure about his English name). That guy is my favourite character already and he has barely shown up :D. He just looks way too cool and the pretty colours in his hair just makes everything better. What I enjoyed greatly about this episode was that we finally know more of how the hell a lot of things work. We learned the origins or the GT Robos, which are actually really cool in my opinion it’s too bad they’re technically bad guys 🙁, and we also learned more about how Toriko and the other Heavenly Kings fight. It was barely talked about, but apparently these guys have “Gourmet Cells” which make them really strong and which gives them powers like not feeling pain what Mansam did with his skin was retarded by the way and having humongous demons appear behind them when they fight. The only thing I found annoying in the end with this episode was that we saw the Battle Wolves and their love way too much O.o. You know, I know we need to feel sensitive towards the wolves and everything considering one of them is dying, and I know it’s pretty cute and the wolves simply look beautiful but I don’t need to see them licking each others’ faces for 2 whole episodes -_-‘. I was getting pretty bored in the end, despite it being nice and really cute at first. 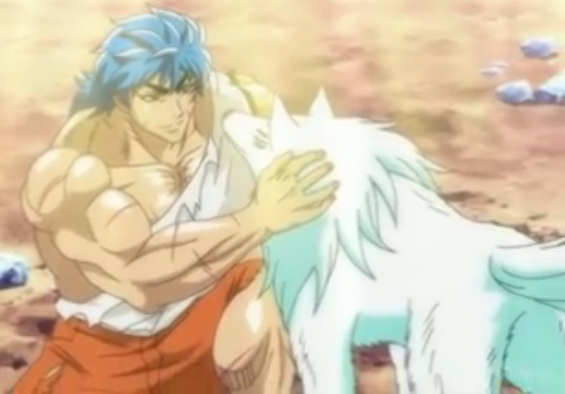 Tagged anime, episode 9, review, toriko. Bookmark the permalink.